My first foray into experimental archaeology came when I was working at the Science Museum of Minnesota, where I was cataloguing the metals collections there. It’s not well-known, but during the Late Archaic Period in the Lake Superior region of North America (Minnesota, Northern Ontario, and Upper Michigan) Native Americans worked with the copper that was easily found there. The culture was aceramic, meaning that they did not make pottery, and so did not have the means to cast or alloy the copper they found. However, they could hammer it, anneal it, and create ornaments such as earrings, finely detailed cut work, along with spears, knives, and arrowheads. It was while I was examining the spears that I started to wonder how they were made. The spears were triangular in cross section and I noticed that they were perfectly smooth on two sides, but on the third side the metal was folded with an almost flowing appearance. This was accentuated by fine corrosion on the surface. Knowing these weren’t cast, the first question I had was how they could have been hammered into a raised shape. The clues were in the surfaces and I reasoned that rather than being poured into a mould, they were hammered in, and the rougher surface was where the metal was packed in and hammered from the top. I carved a block of walnut to create a triangular spearhead and then lit a charcoal fire to anneal the copper. I had a friend standing by with bellows, but they weren’t needed. The charcoal fire aided by a light breeze was hot enough to anneal the copper. The metal was easily hammered into the mould using a hand-held hammerstone. The metal pushed into the mould smoothly along the sides and the top surface was rough from my pushing the edges of the metal from the top edges of the mould and folding them back onto the surface of the spear. I was not only fascinated by the process of making a spear, but also how I had deduced it from examining the original spears in the museum and puzzling out the details. The whole thing was eventually written up and published in The Minnesota Archaeologist. 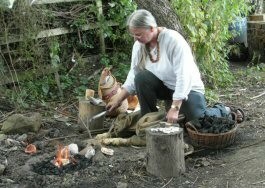 After the first foray into experimental archaeology, I was hooked. From that time forward, I closely examined tools and metal objects, trying to figure out how they were made, what processes were used, and what tools were needed, how those tools were made, and receding back infinitum. This is the crux of experimental archaeology that sets it apart from re-enactment or generally doing craftwork: experimental archaeology starts with a question. Experiments can be done in a lab in order to control as many variables as possible. Experiments can also be done in the field, but unlike re-enactment, not every tool and object needs to be a replica of an original. This is especially true when doing experiments in prehistoric crafts, where few of the original tools still exist. When doing experiments, I can use steel tongs and graphite crucibles, as long as they will not affect the parameters of the question. Likewise in some experiments, for instance trying to learn the melting times for different alloys in a charcoal fire, rather than using bellows I will use an electric pump to make sure that each sample was created under the same conditions. Each experiment must be thought out ahead of time and choices made for each step. The important thing is not to be distracted by the possibilities, but to always focus on the question and to create the conditions that will give a meaningful answer, even if it is inconclusive and leads to other experiments. It’s also important to measure, weigh, time, and quantify as much as possible. For example when experimenting with smelting, the ore should be weighed before and after processing. How long it took for the ore to smelt should be timed. The amount of charcoal used should be recorded. The size of bellows and furnace should be noted. Finally the slag, dross, and refined metal should be weighed and recorded in order to find out how much metal was produced from the ore. The slag could be examined to see if there is any metal left, and note if it could be re-smelted. It can be tedious work at times, and a pain to remember to weigh, record, and photograph everything, but the results will be worth the effort, because the information hasn’t been lost. The data from the experiment you did will lead to more experiments, but will also yield useful information for others.